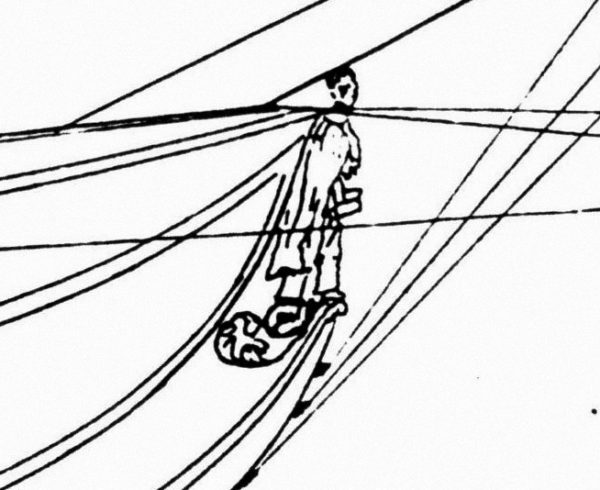 We often regret that no visitor to Edmund Hartt’s shipyard between the years 1795 and 1797 had the courtesy to take up pencil, pen, or brush to give us a depiction of Constitution under construction. In fact, it would be almost six years after her launch before an artist made an image of Boston’s favorite ship. Fortunately, the museum’s collection contains a contemporary image that gives us a glimpse of what a working shipyard looked like. 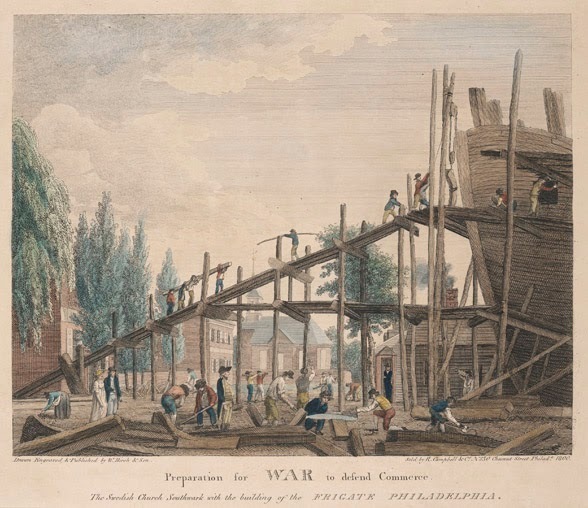 Its full title reads “Preparation for WAR to defend Commerce.” This charming hand-colored print was one of series of views of Philadelphia drawn and engraved by William Birch and his son Thomas in 1800. The series depicts the thriving metropolis in the year before the national capital removed to the new federal city at Washington. Most of the prints include views of public buildings and elegant streets, genteel houses and feats of civil engineering. William Birch and Son’s “Preparation for war to defend Commerce” 1800. USS Constitution Museum collection. Birch depicted Joshua Humphrey’s and John Wharton’s shipyard in the summer of 1799. On the right looms the ill-stared subscription frigate Philadelphia, looking very much like a cartoon Noah’s Ark. Below, ship carpenters busily shape and saw timbers, while beyond, others carry beams and boards up a scaffolded ramp arching over Swanson Street. In the background rises the Old Swedes Church, a familiar landmark that places the scene firmly within the boundaries of Southwark, a district of Philadelphia just down the Delaware River from the city’s busy commercial center. 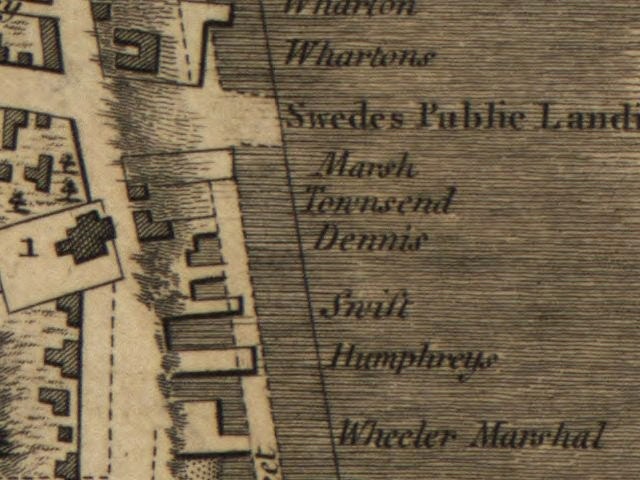 Detail of a 1796 map of Philadelphia by surveyor John Hills showing the location of Humphreys’ yard. The structure marked “1” is Old Swedes Church. Library of Congress. Birch’s eye for detail does not disappoint. Apart from the earliest known depiction of a US Marine (which we discussed here), we also have a number of distinctive characters. There are the hewers working with broad axes to square deck beams. There are the adzemen, putting a fine finish on timbers with their tool’s keen edge. Two sawyers cut a plank to length. 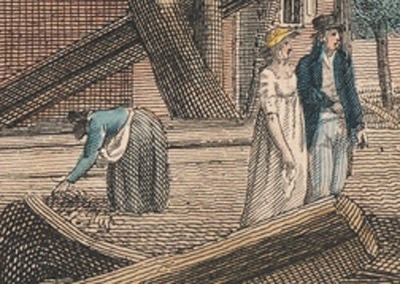 On the left, behind a couple of genteel gawkers, stoops a woman filling her apron with woodchips, an ancient perquisite exercised by shipyard workers and their families. The figure in the center, dressed in a buff and blue uniform, has frequently been interpreted as Joshua Humphreys himself. This seems unlikely. For one thing, he is wearing a captain’s uniform as prescribed in the 1797 regulations. For another, the ship was designed by Josiah Fox and built by Samuel Humphreys (Joshua’s son), Nathaniel Hutton, and John Delavue. The likely identity of this figure is Captain Stephen Decatur, Sr. He was the father of Stephen Decatur, Jr. who would gain fame in the Barbary Wars by destroying the very frigate his father once commanded. The elder Decatur received orders to take command of the frigate on June 20, 1799, and that date fits well with the state of construction depicted by Birch. The frigate was not ready to launch until the end of November. 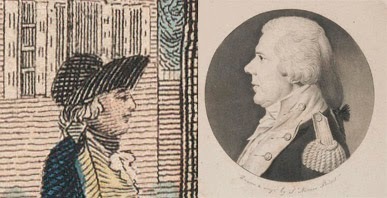 Profiles in courage: On the left, Decatur as depicted by Birch; on the right, Decatur as drawn by Charles Balthazar Julien Févret de Saint-Mémin in 1802. All in all, Birch gives us a faithful depiction of a busy shipyard in the closing years of the 18th century. A year after the image was published, this land and the adjoining plots were purchased by the federal government to form the core of what would become the Philadelphia Navy Yard. Before the yard moved down river to League Island in 1879, the yard launched some of the iconic vessels of the 19th century, including the enormous 136-gun ship Pennsylvania.